After BP’s massive oil spill in 2010, NASA released an aerial image of the oil’s creep through the Gulf of Mexico. The oily mass had momentarily settled into the shape of a giant black swan. It was as if the ocean currents had suddenly developed a dark sense of humour. Despite Sanyal’s cautionary tale, an even bigger black swan is now haunting BP and the entire oil industry at large: the plunge in world oil prices. A supply glut due to the increasing extraction of unconventional fuels such as shale oil and bitumen coupled with weakening global demand has resulted in a 60 per cent drop in price since 2014. BP and other oil majors have suffered major losses as a result, with more belt-tightening anticipated in the next six months. Historically, the Organization of the Petroleum Exporting Countries (OPEC) has coordinated production cuts to stabilize prices. But in this case Saudi Arabia, OPEC’s most powerful player, has resisted calls for cuts. Instead, it has actually increased production, driving prices down further. Why might Saudi Arabia want to keep prices low? Many analysts have sought to explain Saudi behaviour as an attempt to protect short-term market share – primarily by driving high-cost unconventional production out of the market. The evidence points, however, to a longer game that the oil industry still finds unthinkable. The Saudis are betting against oil. Last year, former Saudi oil minister Ali al-Naimi asked an industry conference, “Is there a black swan that we don’t know about, which will come by 2050 and we will have no demand?” Given the centrality of oil revenue to the Saudi economy, comprising 80 per cent of the kingdom’s budget, the House of Saud is highly attentive to the existential danger of a demand shock. Yamani’s timeline was premature, but his prediction was accurate. The combined forces of climate change action (concretized in the recent UN Paris Agreement) and technological innovation that is rapidly driving down the cost of renewables have placed the Saudis on high alert. As a signatory to the Paris Agreement, the world’s primary petrostate understands the existential threat to oil demand spelled out by the scientific consensus on climate change. By keeping production levels high during the price crash, the Saudis can begin terminating higher-cost unconventional producers. These producers are a threat to the amount of oil the kingdom can unload before humanity has exhausted its austere carbon budget and the oil age ends. We are watching the beginning of Saudi Arabia’s endgame. In its latest assessment report, released in 2013, the Intergovernmental Panel on Climate Change (IPCC) calculated how much carbon can be burned without surpassing 2 degrees Celsius warming. According to the IPCC, humanity’s carbon budget is approximately 800 billion tonnes. This allowance is more constrained if we use the 1.5 C target codified in the Paris agreement. While 800 billion tonnes seems lavish, this figure is dwarfed by the carbon contained in known fossil fuel reserves, as calculated by the Carbon Tracker Initiative: approximately 2,800 billion tonnes. While these reserves remain below ground geologically, they are above ground economically – already factored into company share prices and budget projections for petrostates like Saudi Arabia. 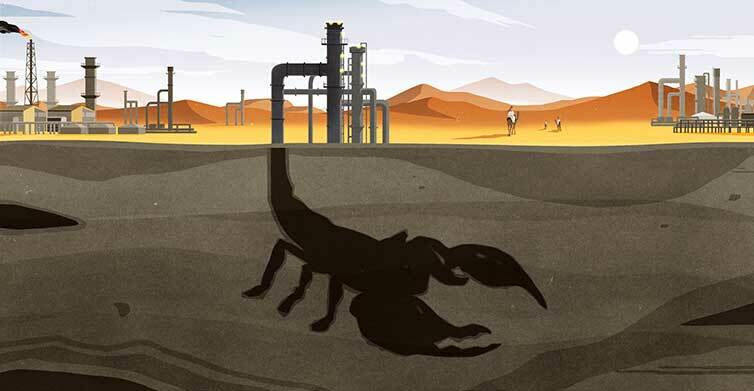 If governments legislate for a 2 C world, huge supplies of black gold will be buried alive. Companies and countries stuck with unburnable carbon will lose billions of dollars. The Saudis want to capture as much of the earth’s remaining carbon budget for themselves, before demand disappears and the carbon bubble bursts. To help capitalize the new fund, the Saudis are planning to sell shares in Saudi Aramco, the currently state-owned company that manages the kingdom’s oil production. The House of Saud will maintain majority ownership, but beginning to financialize its reserves and use the capital to invest elsewhere makes economic sense in a carbon-constrained world. In 2001, BP tried to rebrand itself as “beyond petroleum,” even while aggressively pursuing and extracting unconventional fuels like bitumen. The Gulf oil spill deservedly tarred BP’s new brand. While the disaster cost BP reputational damage and billions of dollars, the new normal for oil prices poses an even greater challenge given BP’s exposure to high-cost unconventional fuel production (a reality for all oil majors). Last year, BP posted the worst financial loss in its corporate history. Saudi Arabia is positioning itself to actually move beyond petroleum. Paradoxically, maintaining high production levels during the price crunch is part of the plan. This will allow the kingdom to cut a larger slice of carbon pie for itself, while economically stranding higher-cost reserves and the companies like BP that own them.